By Rev. Donald L. Perryman, Ph.D.
﻿It appears that my worst fears have been realized: we have made progress in everything, yet nothing has changed. Rev. 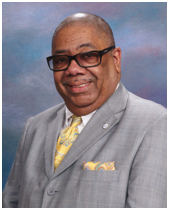 Donald L. Perryman, D.Min. I salute Lynne Hamer, PhD, and Monroe Street United Methodist Church on their third annual community reading of Martin Luther King’s famous “Beyond Vietnam: A Time to Break Silence” speech, given in April 1967 at Riverside Church in New York City. This provocative sermon had such a profound impact on me personally that King’s words “there comes a time when to keep silent or inactive amounts to betrayal…. We believe that now is the time to break the silence ….” were incorporated into my own congregation’s founding resolution on October 12, 1997. We are undoubtedly more diverse in terms of race, gender, age, sexual orientation, able-bodiedness and more since King’s sermon. Sadly, however, little has changed even 52 years after “Silence is Betrayal” as we have been unable to leverage our differences to create the “beloved community” that King dreamt about. We have far more women legislators in the U.S. Congress than we had in 1967 or even 1997, yet women are still not safe and free from assault. We are currently in the midst of one of the longest economic recovery periods in American history, yet attempts by “other-abled” persons to bless us with all of their talents are ridiculed at the highest levels of government and threatened with defunding. We allocate more budget dollars to the largest law enforcement and criminal justice systems than ever, yet the rights of LGBTQ persons are dishonored and the lives of black, brown, yellow and red people are dehumanized and disrespected in a manner that suggests the lives of some people don’t matter, at least in comparison with those historically privileged by race or wealth. And the worst thing about it all, perhaps, is that we have lost the fire of indignation that was present in us in 1967 or 1997 and replaced it with a laid-back obliviousness. General Motors’ Toledo Powertrain Plant (among other local organizations) has been the site of entrenched black-white racial tensions manifested by a culture of racial harassment and bullying. There has been an abundance of local and national media coverage of nooses, swastikas, and “whites only” signs being exhibited in the plant, all against a persistent backdrop of racial lampooning, jokes and name calling. We also know, according to the Ohio Civil Rights Commission, that GM (other than an offer of diversity training by the Ohio Attorney General and a $25,000 GM reward), has not “properly addressed” the culture of discrimination and intimidation that it has long tolerated. In fact, the Ohio Civil Rights Commission says that GM demonstrated “indifference” to what was going on in its plant. Indifference! To nooses and swastikas, from the General Motors corporation! Indifference! Not the hot fire of an active, enthusiastic, powerful counter response to the plant-wide backlash to the diversifying of America? Nor the sincere remorse of an organization that understands that it does bear some responsibility to the culture that has allowed these racial tensions to survive, thrive and poison the entire workplace? Oh, it makes me want to HOLLER! And throw up both my hands! Instead, the Ohio Civil Rights Commission suggests that the mammoth-sized General Motors Corporation – the one that was rescued from the brink of bankruptcy by America’s first and only African-American president, and its labor union - with its glorious history of engagement during the civil rights struggle, have been accused of acting as if they are oblivious to or ignorant of the culture of hate that has taken over its Powertrain assembly plant. Indifference is a terrible malady. That’s why silence is betrayal. So, we celebrate Lynne Hamer and Monroe Street Church’s Silence Is Betrayal event. Not because racial injustice has been relegated to a thing of the past. We do so to remind ourselves that our ideals do not yet match our reality. And until they do, we must not be silent anymore. Stop the racial harassment. Stop the bullying. Stop the hate. Replace them with a culture of inclusion, diversity, tolerance, justice and love. Hey Pastors, Get off the Bucks!